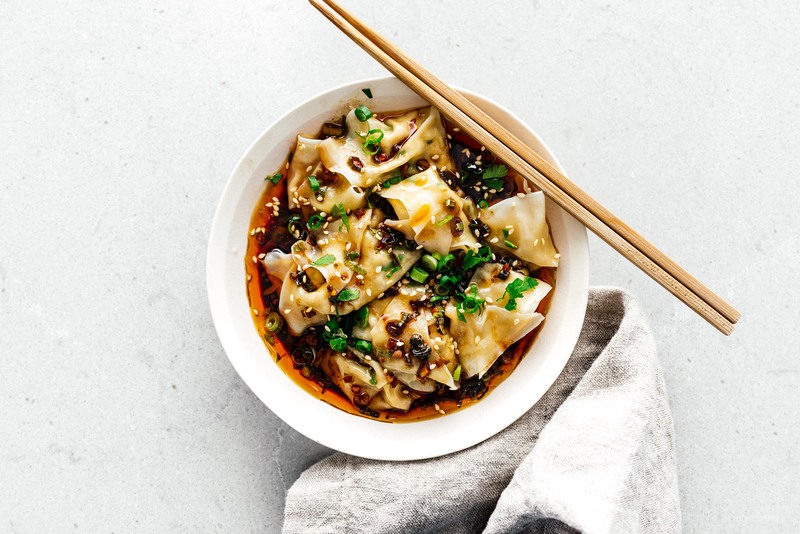 Tofu wontons in a spicy chili oil and vinegar sauce. 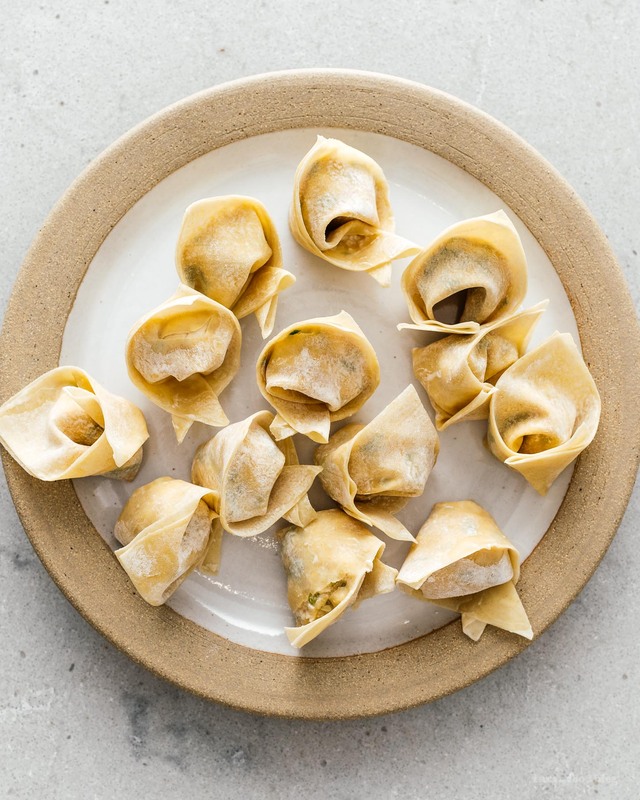 If you’re a vegetarian and forever lamenting the fact that you can’t have wontons, these guys are for you! 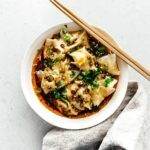 The filling is made with a simple mix of firm tofu crumbles, seasoned with salt, ginger, white pepper, and green onions. It’s super simple but so satisfying. Make sure you drain your tofu well and dry it out as much as possible so that the filling isn’t too wet. You can even go a step further and give it a press: line a plate with paper towels, the put some paper towels on top and weigh the tofu down with another plate. 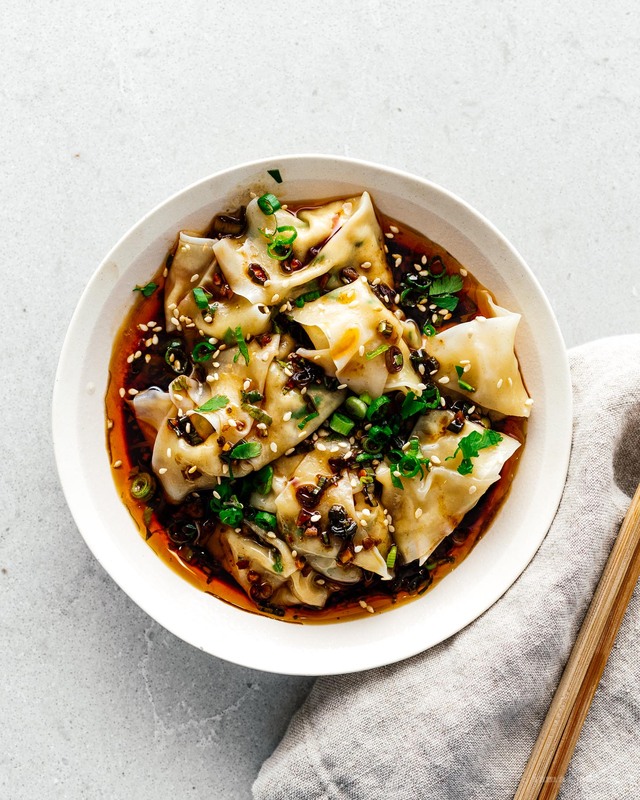 The best thing about these wontons is that the filling is completely cooked so you can adjust the seasoning just by tasting. Just make sure that the filling is slightly more saltier than you would have it if you were just eating it on it’s own. Wonton wrappers don’t have much in the way of seasoning. These guys cook up in a flash because all you’re doing is cooking the wonton wrappers. Once you pop them in the boiling water and they float to the top, you’re good to go. Give them a toss in a spicy-soy-vinegar dressing and you’re in heaven! Notes: I used half a block of a 1 lb firm tofu. Make sure you dry out the tofu and drain on paper towels before crumbling up and using. In a bowl, crumble the tofu and mix with the cornstarch, green onions, and ginger. Taste and season with salt and white pepper. You want the mix to be slightly saltier than you think. Take a wonton wrapper and place 2 teaspoons of the tofu filling in the middle. Dip your finger into water and lightly wet the edges of the wrapper. Bring one corner of the wrapper to the other corner to form a triangle. Fold in the other two corners, wet, and pinch to seal, trying to get any air bubbles out. Alternatively, just wet the edges of the wrapper and bring together and pinch into a small pouch. Keep the wrappers and finished wonton covered with saran wrap as you work, to keep them from drying out. When the water is at a rapid boil, add in your wonton. Stir gently so they don’t stick to the bottom of the pot. Cook for 2-3 minutes or until the wonton float.